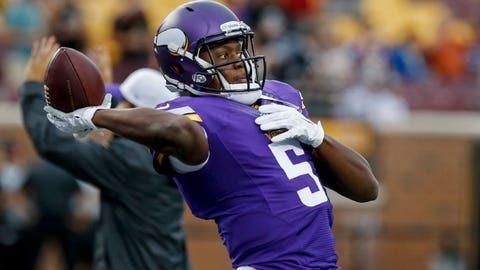 Vikings QB Teddy Bridgewater threw two interceptions in a win over the Chiefs this weekend. The Minnesota Vikings can win with Teddy Bridgewater at quarterback. He’s not the NFL’s most talented passer, yet he’s aware of his own limitations. Bridgewater is a smart quarterback who should be trusted to make all the right decisions. However, when running back Adrian Peterson gets bottled up like he did against the Kansas City Chiefs in Week 6, Bridgewater is forced to do more with his arm to keep Minnesota’s offense moving. As a result, he threw two interceptions to Kansas City’s defense on Sunday. The Vikings’ first drive of the game ended with a pick on a throw Bridgewater wishes he could have back, per ESPN’s Ben Goessling. "Throw the ball away, kick a field goal," Bridgewater said. "We could have ended that with three points in that situation." Bridgewater has led the Vikings to a 3-2 start, but he has thrown four interceptions and only three touchdowns during that span. On top of that, the second-year pro has only eclipsed 250 yards passing once this season. This, of course, is not a problem when Peterson is pounding away. But the Vikings should be concerned about their fortunes when Bridgewater is asked to win the game with his arm. They aren’t blowing teams out, and one bad decision could make all the difference.